I can't quite recall what originally prompted me to put this sandwich together. But it's been a house favorite for the past five years or so and is really easy to make. This sandwich is all about the mayo. Asian seasoned mayo. Pampered Chef Asian Seasoning and mayonnaise are a match made in heaven. The seasoning packs a nice punch with garlic, red & green bell pepper, sesame seeds, soy sauce, orange and lemon zest, lime, green onion and ginger. So add as much or as little to your taste. We like a lot! We hadn't had this sandwich in quite some time because we ran out of the Pampered Chef magical blend. I finally broke down and ordered some online and just a few days later we were back in yummy sandwich makin business! As a side note, the shipping on my order cost nearly as much as the seasoning....so I stocked up to make the most out of my purchase. I also ordered a greek seasoning blend that I'm excited to try out. Now that the spring is officially here....grilling has kicked into full swing at our house. 3 of the 4 components of this sandwich are done on the grill so Hubby plays a big part in the creation of this meal. Generally I prep everything for the grill and Hubby does the grilling, then I assemble it all. So I did my part and had it all ready to go to the grill...but guess what? The grill was out of gas. So we had to to turn to plan B. The grill pan. I have to say the results weren't quite the same as the hint of charred goodness you can only get from a grill...but it was still quite good. The chicken is marinated in a store bought teriyaki sauce then grilled. I prefer a sauce that has pineapple juice in it. But any asian inspired marinade (store bought or homemade) would do just fine. The chicken is sliced and topped with tender roasted red and yellow peppers (also courtesy of Hubby's fine grill work). 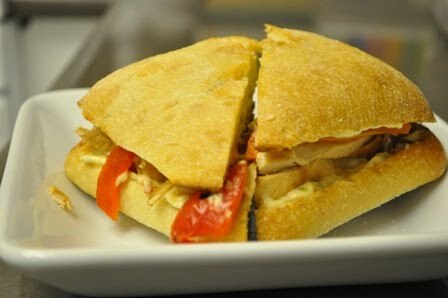 Sandwiched between two asian mayo slathered pieces of freshly grilled ciabatta bread....it's delicious! Don't skimp on the mayo. Really! Marinate chicken in teriyaki sauce for 4 hours up to 1 day. Combine mayo and asian seasoning in a small bowl and set aside in the fridge. Roast peppers on high heat on the BBQ until skins are charred black and interior flesh is tender, about 20 minutes. Transfer the peppers to a deep bowl and immediately place plastic wrap over the top sealing in the heat. When peppers are cool enough to handle, remove the charred skin and cut into 2 inch strips, removing seeds, ribbing and stem. Grill chicken until done, about 10-12 minutes. Allow chicken to cool for at least 5 minutes and slice 1/2 inch strips. Cut ciabattas in half and (lightly brush with olive oil if desired) toast on grill 2-3 minutes to desired toastiness. Generously spread mayo on bread and top with chicken and peppers. And most importantly.....Enjoy!